In this post, we have listed all types of Idle Games; Idle, Idle Clicker, and Idle RPGs. If you have more recommendations, do let us know in the comment section below. Additionally, we will keep this post up to date and post new Idle genre games on regular basis. 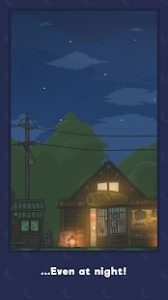 Tsuki Adventure is an offline game, developed by Hyperbeard. It’s completely Idle; you don’t need to tap over and over again, there is no action, fighting, upgrades, and all clutter stuff. The main character is Tsuki who explores the environment automatically over time. All you need to do is gather carrots, buy items, interact with the cute characters. It’s relaxing, charming, and beautiful Idle game we have ever played. The music it features will relax your brain. You can get it from Google Play Store. It falls in our top Idle games for Android list because of a number of reasons; lets you build a team of monsters who will destruct the cities, boss battles, skill casting, pet system, and loads of upgrades. It is published by PIKPOK, the creators of Into the Dead game series. Monsters attack the enemies automatically, skills are unleashed by the player – manually. 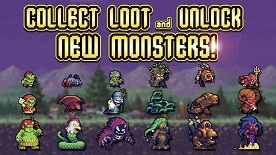 You’ll summon, enhance, evolve, and power up the monsters to destruct everything. Get it from Google Play Store. DIGSTAR is another game that falls in our top Idle games for Android list. Unlike other simple Idle games, this one features extra things; creatures, expedition, base building, building upgrades, and more. Prestige feature is also there. In this game, you will explore the planets, produce the resources, sell the resources for coins, and move to the new galaxy for EXP. You will use these precious points in developing own base, creatures, and building space crafts. Get it from Google Play Store. Hooked Inc – Fisher Tycoon is one of the best Idle games for Android. In the game, you have to build your own fishing empire by expanding your networks. 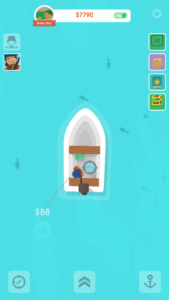 You start the game with a simple boat and catch fishes. You just tap and swipe to catch fishes. The more you collect, the more will be the earnings. Invest your profit in upgrading resources such as the boat, rod, and more. To earn passive income, you recruit crews who work for you and manage your business. Catch some rare and epic fishes to maximize the earnings.It’s an addictive idle clicker game for Android with a cool concept and job. A Must try. Travel the sea, catch epic fishes, grow your fishing empire, and have fun. Get it from Google Play Store. In this game, you own a factory and the goal is to expand the factory business. Initially, you have to manually take care of all things such as market, warehouse, and the workstation. But as soon as you hire the workers, you will earn Idle. After it, your work is to maintain the cash flow. It’s up to you how you upgrade the resources to maximize the earnings. The reason it falls in our top Idle games 2019 list is its unique concept, new content from regular updates, and thousands of levels. 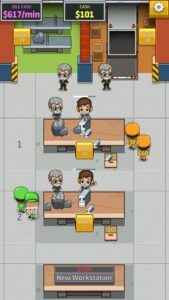 Download Idle Factory Tycoon – Here[Google Play Store]. Kung Fu Clicker is one of the best Idle games for Android, featuring PvP mode, lots of characters, a decent upgrading system, and much more. PikPok has recently released this Idle game for Android on Google Play Store. In this game, you earn money by running a dojo. Your objective is to keep the school safe & secure from the evil gang. The evil gang visits you every few minutes and steal the money. Your objective is to stop them by appointing the martial arts teachers in the rooms. The game also features PvP mode in which you raid other players’ martial arts school and earn lotus(in-game item). Download – Here(Google Play Store). 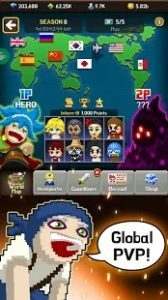 Semi Heroes – Idle RPG by DIVMOB is another one of the excellent Idle games for Android. It is an offline Android game in which the player assembles a team of heroes and deploy the heroes on the battleground to stop the evils who are ruining the trees. However, it would not be easy because of powerful bosses with tremendous power and they can easily slay down the heroes. The player has to upgrade heroes to slay down enemies. Each hero has a special skill. The player improves the skill by upgrading the hero to the next level. Your heroes attack enemies automatically. Victory depends on your playing strategy; how you use the heroes’ skill. Get it from Google Play Store. World Zombie Contest is another Idle RPG for Android by Mobirix. 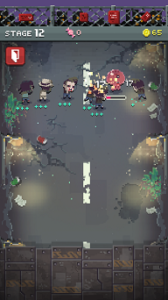 In the game, the player assembles a team of zombies and slay down the powerful bosses in the battle. You discover new zombies by merging, upgrade the level of zombies, unlock new features, earn gold coins and candies, clear stages, and win boss battles. There are many types of monsters featured in the game. To slay down these monsters, you need to discover new zombies, increase the attack and damage power of zombies, and complete the research. It is one of the best Idle games for Android. It’s a challenging, addictive and great time killer Idle game for Android. Get it from Google Play Store. Idle Hero Defense is pretty good Idle game for Android by Iron Horse LLC. And if you are looking for a completely unique and engaging Idle game, then you should give it a shot. In this Idle RPG, you recruit a number of heroes(melee, mage, range) on the battlefield to clear the waves of enemies. Since it is an Idle game, you just have to manage the upgrades, hero selection, and skills. The recruited heroes raid the enemies automatically; however, the game also lets you move them manually by tapping. Overall, it is a good Idle RPG. Download – Here(Google Play Store). 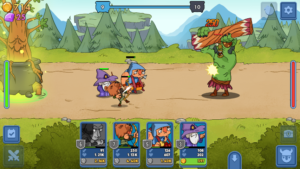 Videogame Guardians is a brand new Idle game for Android in which you recruit the guardians and slay down the monsters. In this game, your objective is to build the party of best guardians. Getting 5-star heroes in this game is not an easy task. The game also features a wide range of modes; pyramid, Adventure, PvP, events, and more. Things you do in this game are; manage miners, scientists, and guardians. Miners produce gold, gold used in upgrading the guardians. Scientists produce flask, flask used in upgrading boosters & unlocking boosters. Download – Here(Google Play Store). It is a fun Idle clicker game in which you have to take care of the animals, growth of zoo, zoo improvements, and trading. In the game, you buy animals, sell animals, earn the profit, spend some money on zoo improvements to earn passive income, and do trading. Buy animals and expand the zoo business. Monitor the birth rate and death rate of animals to avoid loss. Add more facilities such as drinking, bathroom, shop, and more to the zoo for passive income. Increase the selling price of animals to increase income. It is an addictive idle clicker game for Android. Get it from Google Play Store. These are the top new best Idle games for Android that are worth playing. We will update this post soon with more best Idle Android games.